San Diego, Is Your Home Ready For Fire Prevention Week? Next week is Fire Prevention Week, which serves as a reminder of the importance of fire safety and preparedness. In 2014, there were approximately 379,5000 residential building fires which led to a loss of 2,765 lives, $7 billion, as well as 12,075 injuries. Unfortunately, California was a nationwide leader in the number of fire-related deaths. It’s important that you get started now because most home fires tend to occur during the fall and winter months, peaking in December and January. In order to keep your home from joining these statistics, you’ll want to take some steps to make sure that you and your home are prepared for a fire! Placement – The NFPA recommends that you install smoke alarms in and outside every sleeping room, in addition to every level of your home. Testing – You should be testing your smoke alarms at least once a month and replacing batteries when necessary. Replacement – Smoke alarms don’t last forever, you’ll a want to replace the smoke alarms in your house every 10 years. Create a fire escape plan and make sure everyone in your family is aware of how to escape in case of a fire. The Burn Institute has developed an interactive tool for you to create a family fire escape plan. Not all fires (like electrical fires) can and should be put out with water. This is why it is important for you to have a fire extinguisher in your home. Fires are broken down into 5 different classes (A,B,C,D, or K) depending on the cause of the fire. In general, you’ll want to get a multi-purpose fire extinguisher, such as one that covers A-B-C fires. This will cover ordinary combustibles (such as cloth), flammable liquid (like oil), and electrical appliances and tools. Make sure you are aware what your fire extinguisher can put out because if you use the wrong type, you may end up just making the fire worse. Get training – While fire extinguishers can be very helpful, you also need to know how to safely use them. Contact your local fire department to get training on how to use your fire extinguisher. 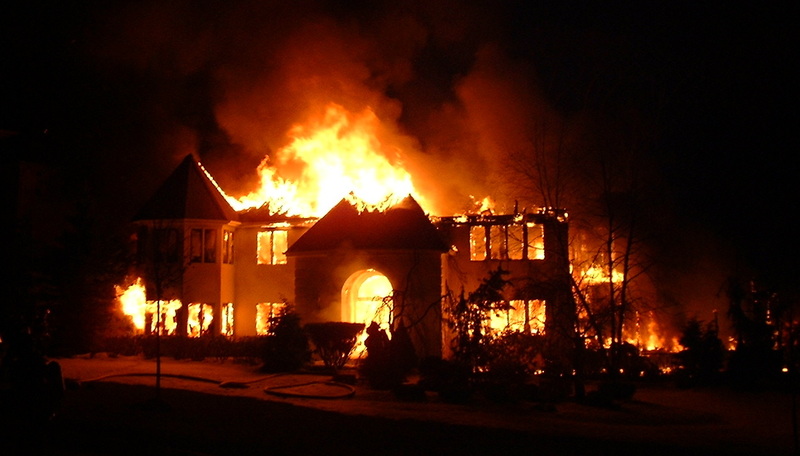 Cooking – 50% of residential fires were caused by cooking, making them the #1 cause of residential fires. Here are some cooking and kitchen cleaning tips that will help keep you safe! Stay present – It can be tempting to leave the room to do something else when you’re cooking, but I would advise against this. The American Red Cross found that nearly 90% of kitchen fires were caused by unattended cooking. Stay alert – While it is not only important to stay in the kitchen while you cook, you’ll also want to make sure you are paying attention. Watch your food to see if it starts to burn and make sure your oils aren’t overheating. One sign that your grease is overheating is if start to bubble or smoke. Keep your kitchen clean – Make sure that you regularly clean all of your cooking surfaces to avoid grease buildup. Also make sure you keep your general cooking area is clear. Watch out for any flammable objects, such as clothing, food wrappers, or oven mitts. Collect your grease – Rather than throwing away your grease in the garbage (where it can ignite with combustible materials) or pouring it down the drain (where it can cause your pipes to clog up), I would recommend recycling it. You can pour the oil into an old metal can and store it fridge or pantry, and once it’s full bring it to your local recycling center. (Tip: You’ll also want to check first to make sure that they will accept grease). Smother a grease fire – If a fire does happen to start on your stovetop don’t put it out with water. You’ll want to smother the fire, so it helps to keep a lid nearby. If you do not feel comfortable doing this, make sure you clear everyone out of the house and call 911 from outside. Heating: 12.5% of residential fires were caused by heating issues, below we’ve listed areas to look out for and some quick tips. Watch the coils – Coil space heaters pose and added danger because if the coils become too hot then they potentially might ignite any nearby flammable item. Watch the type – Radiator-type that diffuses heat over the entire surface, making them less likely to serve as a fire starter. Keep an eye on the space heater – Don’t leave portable heaters on and unattended. This also means that you must turn them off when you are going to sleep. Keep it in a safe place – You’ll want to make sure that you keep your space heater on a flat surface and away from flammable objects, children, and pets. What not to put in your fireplace – Avoid burning cardboard, paper, trash, or Christmas trees. These items can spark and potentially lead to a chimney fire. Watch out for creosote buildup – Creosote, is a chemical mass of carbon that is left over after wood and can buildup in your chimney sweep. It is nasty because it will limit the airflow in the chimney, it’s combustible, and it’s toxic. Unseasoned, or dry, wood can be a culprit of leaving unburned creosote in your chimney, so it is important that you make sure you are using dry wood in your fireplace. Invest in a fireplace cover – These will prevent all the embers and sparks from escaping and catching things on fire. How to spot a chimney fire – Some signs of a chimney fire include a sucking sounds, a loud roar, or shaking pipes. Get inspected – The National Fire Protection Association recommends that homeowners should have their heating and chimneys cleaned and inspected every year by a qualified professional. Keep a “kid-free zone” of at least three feet around any open fire or space heaters. This is for their general safety as well as fire prevention. Electrical outlets – Make sure they are tight and fitted to the wall and that all of the wiring is covered with a plate. Never try to sever the third prong on a plug to plug it into a two-pronged outlet. Don’t overload your outlets, this might cause the outlet to spark and possibly start a fire. If you notice that your outlet is uncharacteristically warm, this might be a sign of a faulty outlet and will be something that you’ll want to get checked out. Plugs – When you are unplugging appliances make sure that you are pulling by the plug and not the cord! This will keep strain off the wiring of the cord. Flammable Materials – Items such as curtains or blankets should be kept away from electrical appliances and outlets. It they do happened to spark, they might catch these items on fire! To keep the fire from spreading quickly too or from your home you’ll want to check how much dead grass you have surrounding your home. A very simple and eco-friendly way to cut down on grass is by putting some goats in your yard. They will eat up the grass and help you prevent a potential grass fire. Cords – You’ll want to keep cords away from doorways or under carpets, make sure that you check your cords to see if they are damaged or loose and replace those that are. Extension cords should not be a permanent fixture in your home. If you need closer outlets, you should talk to your electrician. Wiring – You might notice that your wiring is faulty if your plugs spark, you hear a buzzing sound emitting from your outlets, your lamps flicker, or your breakers that constantly trip. Aluminum wiring is more fire-prone than copper wiring. If you find that you’re home has aluminum wiring then you might want to have an electrician install copper connectors at receptacles and breakers. It’s also important that you get your wiring looked at. Fire officials recommend that you have a licenced electrician come take a look at your home every 10 years. Don’t forget to get the wiring checked out on a home that you are looking to buy. Light bulbs – Make sure that you use the appropriate wattage when you replace your light bulbs. If it is too high, then this might cause the wiring or fixture to overheat and cause a fire. If you need any tips or help about fire prevention or safety, be sure to check our your local fire departments website. If you visit the Lemon Grove Fire Department Website you find lots of resources and guidelines to keep you safe!